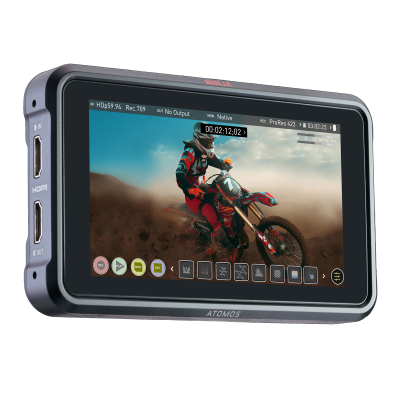 A stealthy, 5-inch, 4Kp60 10bit HDR daylight viewable 1000nit portable monitor/recorder. Perfect for Mirrorless, DSLRs and Gaming. Record up to 4Kp60 10-bit HDR video direct from your camera's sensor, over HDMI, 2.0. Store edit-ready ProRes or DNxHR on affordable SSD drives and bypass your cameras internal compression and record time limits. A tiny 1TB AtomX SSDmini will give you 2.5 hrs of 4K recording. The SSD ... made Mini! The new AtomX SSDmini is a little over 1/4 inch tall and 3" long. It is also 20% shorter than traditional SSDs, yet keeps the standard SATA III connector. It is backward compatible with previous Atomos drives by adding a clever extension handle. These tiny, slimline SSDs are a true innovation and our close drive partners Angelbird, G-technology and Sony are all making custom versions for your Ninja!